The award winning Disability Induction Program is an industry endorsed program designed to assist employers in preparing their workforce to be work ready in today’s disability sector. Check out the video below to get a snapshot of the program. The program demonstrates, through scenario based learning, how to place a person with disability at the centre of all decision making and operational activities; and is suitable for both new and existing employees – regardless of their role. On completion of the program, users will have a comprehensive, as well as practical understanding of work in the disability sector. The program is available online through carecareers.com.au and comprises of 5 elearning courses (made up of 12 separate modules). It is also available in a print-based version for those without internet access. On completion of the first online module from course 1, 'It's a great career if you enjoy working with people', users are invited to either register or login to view their personal career hub and to access the other 11 modules available. Online users will be able to download a certificate of completion after each course. There are 5 certificates to collect. Job applicants can attach the certificates to their resume when applying for jobs and existing employees can provide employers with copies for their personal file. 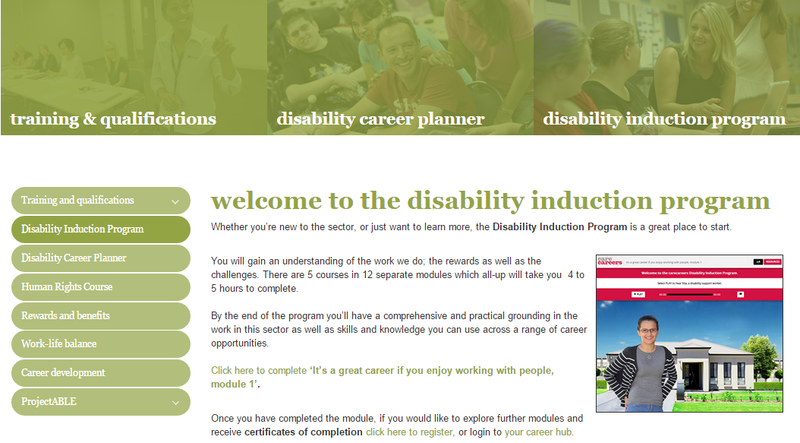 The Disability Induction Program can easily be incorporated into your existing learning and development initiatives. Take a look at our recorded webinar (24:40 mins) to find out more. - An Employer Guide [PDF 1100KB] [WORD 65KB] has been developed to provide employers with advice and guidance on the implementation, facilitation and assessment of the online and print-based versions of the Disability Induction Program. It also provides information on how to use integrate and customise the program's content in face-to-face workshops. - A User Guide [PDF 1790KB] [WORD 35KB] is available to assist participants in completing the online and print-based versions of the program.